Three years after the Northern Railways suffered over Rs 15 crore losses in purchasing reflectors, station signboards and railway crossing boards at inflated rates, the Railway Vigilance Department in Delhi has issued charge sheets against 24 employees of the Ferozepur Railway Division for causing the losses by circumventing the purchasing authorisation limits. Arbout 26 per cent of the water samples collected by the Bathinda health authorities in eight months (between January and August) have failed the bacteriological test during first testing, conducted to check the presence of E-coli bacteria at the Public Health Lab, Chandigarh. A rebel with a cause and a sitting SGPC member, Hardeep Singh is taking on the might of the establishment in Mohali constituency, a stronghold of the Akalis. Born on July 7, 1958, in Raikot (Ludhiana), Amarjit Singh Chawla, a former member of the Punjab Public Service Commission (PPSC), is trying his luck in the SGPC election for the first time from Anandpur Sahib (general) constituency. For the second time, Sehajdhari Sikhs may find themselves out of the polling booths on September 18 when the Shiromani Gurdwara Parbandhak Committee (SGPC) goes to the polls. At least six SAD legislators have withdrawn themselves from the SGPC poll, expressing resentment over certain issues. This is for the first time that the SAD is facing the challenge of curbing dissidence. After meeting Prime Minister Manmohan Singh for the introduction of the Anand Karaj (Marriage) Act, Punjab Pradesh Congress Committee President Capt Amarinder Singh met the Union Law Minister Salman Khursheed in New Delhi last evening. The Shiromani Akali Dal has condemned the letter written by the Congress to the Election Commission complaining against the Punjab Government on development loans. The SAD described the move as a political conspiracy to stall the development process in the state. Deputy CM Sukhbir Singh Badal today claimed that the Punjab Government had collected a whopping Rs 30,000 crore more revenue than the previous Congress regime and that the PPCC chief, Capt Amarinder Singh, was “befooling” the people on the issue of state debt. Punjab Pradesh Congress Committee President Capt Amarinder Singh today asserted that the Akalis would have to account for each and every rupee of the SGPC funds they squandered away without any accountability. Despite the tall claims by the Patiala Municipal Corporation pertaining to preventive steps being taken to ensure that there is no outbreak of any epidemic, malaria has claimed three lives in Chailaila village in the past few days. Despite the fact that Patiala has been witnessing numerous cases of malaria and dengue every monsoon season, the civic body as well as the Department of Health and Family Welfare have failed to take preventive measures in this regard. Rebutting all existing theories and perceptions with regard to the source of uranium in groundwater in the Malwa region, a team of scientists from the Panjab University has questioned the linking of uranium to cancer cases in that region. Two days after a Class X student of Kauni Jawahar Navodaya Vidyalaya in Faridkot was sent on ‘forced leave’, 31 classmates of the boy fled the school on Monday night and took shelter in a gurudwara at Sultanpur Lodhi in Kapurthala. After joining Canadian army as a trooper in 1989, Harjit Singh Sajjan, now a Lieutenant-Colonel, has became the first Indo-Canadian to take command of a Canadian regiment. He took over as Commanding Officer of the British Columbia Regiment yesterday at a glittering ceremony held at Beatty Street Armoury in Vancouver. Prof Sukhmeen Kaur Hanjraw, Head of Department of Computer Sciences, Khalsa College, Patiala, has made the city proud after she was selected for this year’s prestigious “Rashtriya Gaurav Award” along with a Certificate of Excellence by India International Friendship Society. The award will be delivered during a seminar on “Economic Growth and National Integration” at New Delhi on September 16. Veteran freedom fighter and a close aide of Netaji Subhash Chander Bose, Ram Parkash Sharma died at his residence here yesterday. He was 98. Ram Parkash Sharma was cremated with full state honours today. Hundreds of people, including family members, politicians, district officials, paid tributes as the contingent drawn from the Punjab Police reversed their weapons as a mark of respect to the freedom fighter. It was festivity time at the house of 26-year-old Kulwinder Singh after his family at Bansipura village near Jagraon got to know about the release of their son by Sharjah Appeal Court. He was among the 17 Indian youths convicted in the murder case of Pak resident Mishri Khan. The Supreme Court today upheld the death sentence awarded to a Ludhiana man convicted for killing his wife, two daughters and a son by setting them ablaze after pouring petrol on them in April 2003. Many senior officials of the Railway Engineering and Accounts wings are among those who have been served the charge sheet. The charge sheet was issued after two separate inquiries by the Railway Vigilance Wing and the CBI. Four days back, 24 charge sheets were received and these have been further served to 22 officials of the Engineering Wing and 2 of the accounts branch of the Ferozepur Railway Division, said Divisional Railway Manager Vishwesh Chaubey. Besides many Senior Section Engineers (Works and P-Way), a retired Additional Divisional Railway Manager, a Divisional Manager, an Assistant Divisional Engineer (now posted at Gurgaon) of the Railway Engineering Wing and a Senior Section Officer (accounts) are among the 24 charged sheeted employees. The case relates to purchase of a huge number of reflectors, station sign boards and railway crossing boards three years back for 242 stations in Punjab, Jammu & Kashmir and a part of Himachal Pradesh under the Ferozepur Railway Division. For the purchase of these boards, the Railway Engineering and Accounts Wing in Ferozepur were required to send the indent (order) to the Northern Railway Store Department, Baroda House, New Delhi. For making this bulk purchase, the approved firms were to be invited for tenders. But to give benefits to some local firms, the accused officials circumvented the purchasing authorisation and split the purchasing transactions in over 1,000 parts so that there was no need for the approved firms and no competition among the suppliers. The purchase of the reflectors and boards of over Rs 30 crore was made at exorbitant rates, up to 100 per cent more than the competitive market prices, reveals vigilance probe. The accused officials in the Ferozepur Railways even did not bother to submit the indent (orders) to the Railway Store Department on the Railway specific performa. But it was the private contractors who got printed these indents (orders), fill these over 1,000 forms themselves and submit these to the Store Department. After a complaint to the Vigilance Department, an inquiry was started and after preliminary investigation, the case was handed over to the CBI, Chandigarh, said head of the Vigilance Wing of the Northern Railways Mohammad Jamshed. Probing the case, the CBI raided the houses of some senior officials of railway engineering wing in Punjab and the Store Department in Delhi, revealed sources. Deputy Chief Vigilance Officer, Northern Railways, Sanjay Kumar who is heading the investigation in the scandal, declined to share information, saying the investigation was near conclusion. The health authorities collected 393 water samples from various parts of the district during first eight months of this calendar year, of which 96 samples (about 26 per cent) failed the test.The results of 20 samples were awaited. After the failure of water samples, the health authorities got seven domestic water sources (three in Bathinda and four in Chughe Kalan village in Goniana block) closed during the first quarter of this calendar year. The water samples were collected from water sources of Punjab Water Supply and Sewerage Board (PWSSB), Rural Water Supply and Sanitation Department (RWSSD), local bodies, government schools, private schools and others, including reverse osmosis (RO) plants, hand pumps, ice factories, etc. Of the 96 failed water samples, four were collected from PWSSB water works, 21 from water works of RWSSD, five from local bodies, 33 from government schools, six from private schools and 27 from other sources. Pitted against JP Singh, a new face fielded by the SAD (Badal) who is harping more on the development being undertaken by the establishment in Mohali, the veteran SGPC member has to his credit two consecutive terms in “mini Parliament” of the Sikhs since 1996. Hardeep Singh is relying more on his personal rapport with different religious groups and intelligentsia and promises to liberate the SGPC from “political interference”. Facing a tough contest from JP Singh, Hardeep, who is the protégé of Prof Manjeet Singh, a former Akal Takht Jathedar, and Jasbir Singh Khannewale, a prominent religious figure, is hopeful of cashing in on the largely urban vote bank that is concentrated in Mohali. Of the total around 37,000 voters, around 22,000 are concentrated in the urban areas, with the remaining in rural areas scattered around the city. For Hardeep Singh, the day starts at 8 am when he attends religious functions in various gurdwaras of the city. During his door-to-door campaign, he tried to strike a chord with the educated voters by driving home the issue of SAD (Badal) politicising the Sikh politics and blatantly controlling the affairs of the SGPC. Addressing a rally in Phase 3B2, he said there was no provision under the Gurdwara Act, 1925, that allowed controlling the temporal seat of the Sikhs in a particular manner by a specific party. “There were lot of shortcomings in the Gurdwara Act, 1925, but the SAD had done nothing to remove them. A long pending demand to have an All-India Gurdwara Act has never been taken seriously by the ruling group,” he said. Initially tipped to be the SAD (Badal) candidate as he enjoyed the “support of Prof Prem Singh Chandumajra”, the sitting SGPC president, Avtar Singh Makkar, is learnt to have opposed Hardeep Singh’s candidature due to conflicting stand on various issues in the past. Locked in a straight contest with Sardool Singh Kulgra of the Panthic Morcha, Chawla's proximity with Chief Minister Parkash Singh Badal has made electioneering extremely comfortable with the entire SAD (Badal) activists and leaders from Anandpur Sahib working round the clock to ensure his victory. Notably, Anandpur Sahib constituency holds lot of religious significance for the Sikhs as several historical gurdwaras are situated here. A post-graduate in Agriculture, Chawla has been associated with the Sikh Students Federation (SSF) since his college days. In the early 80s, Chawla became the general secretary of the SSF. Though Chawla remained associated with the Akali Dal for long but it was in 1998 that he formally joined the SAD (Badal). Considering his contribution in the victory of the SAD-BJP alliance in Punjab in 1997, Chawla was given the plum post of PPSC member by the then Akali government in November 2000. "It’s been three decades of my association with the SSF. I spent almost 11 years in different jails when there was extreme unrest and turmoil in Punjab. My only objective of life is to serve the Sikh community," said 53-year-old Chawla. Considered to be an outspoken political personality, Chawla is a good orator. Chawla promises that if he makes it to the SGPC, he would make all out efforts to bring a state-of-art medical and engineering college in Anandpur Sahib. Rejecting that he was an outsider in Anandpur Sahib, Chawla said, "I am an Amritdhari Sikh and as per the Sikh Maryada (tradition), every Amritdhari Sikh is resident of Anandpur Sahib." With 50,000 electors spread over 250 villages of the constituency, Chawla is touring at least 25 villages in a day. "I am sure that not only me but all the Akali candidates will emerge victorious on September 22, the day the counting will take place," he says. Harmeet Singh Sidhu, a resident of Baddal village, says: "Amarjit has a vast experience in politics. He has worked as a PPSC member as well and, therefore, he can prove an asset for the people in Anandpur Sahib constituency if he wins." Hearing a bunch of three petitions challenging the Centre’s action of debarring Sehajdhari Sikhs from exercising franchise during the SGPC elections, a Full Bench of the Punjab and Haryana High Court today adjourned the case to September 20, two days after the SGPC polls. The Full Bench of Justice MM Kumar, Justice Alok Singh and Justice Gurdev Singh will now hear the case on the day the results are to be declared. The results, however, continue to be subject to the decision on the writ petitions, as ruled by the court earlier. The only immediate hope for the Sehajdhari Sikhs is a favourable order from the Supreme Court, which hears a petition by the Sehajdhari Sikh Federation tomorrow. The adjournment of the case by the High Court comes as a major relief for the SAD-led Punjab Government, which was keen on going ahead with the SGPC elections. In 2004, the Gurdwara Election Commission debarred the Sehajdhari Sikhs from voting in the SGPC elections, deleting the names of 12.5 lakh Sehajdhari voters from the voters’ list. The notification, dated October 8, 2003, disenfranchising the Sehajdharis, was issued on the basis of an SGPC resolution dated March 3, 2002. As the case came up for hearing this afternoon, replies by the SGPC, the State of Punjab and the petitioner were placed before the Full Bench. The Centre has already filed its reply on the issue of recalling an earlier order, disposing of the petitions, on the basis of an assertion by senior advocate Harbhagwan Singh. Harbhagwan Singh had told the Full Bench that he was appearing for the Centre and the impugned notification disenfranchising Sehajdhari Sikhs stood withdrawn. But, the Centre the very next day had clarified that the notification was still in force. Supporting the Centre’s stand, the reply, handed by Punjab’s Additional Advocate-General Mukesh Berry, said the Union of India’s application was worth considering as “a deliberate and intentionally wrong statement” was made by Harbhagwan Singh. Appearing for the SGPC, advocate Gurminder Singh called for recalling the order, while insisting that the petitioner (Sehajdhari Federation)had not made its stand clear. Gurminder Singh said on the previous date of hearing, the federation had conceded to the demand for recalling the order. But, had taken a contrary stand in its reply. After hearing the arguments for 15 minutes, the Bench decided to adjourn the case till the Supreme Court decision. It is believed that there are at least 40 seats in Punjab where the SAD is having a tough time tackling the dissidents. Even in Chandigarh and in Haryana, Chief Minister Parkash Singh Badal has issued personal appeals to voters to remain united against those trying to divide the Sikhs. In a SGPC General House of 190, elections are to be held for 170 constituencies. The SAD has denied seats to 90 sitting candidates, with its ally the Sant Samj contesting over 30 seats. Many dissidents are likely to follow the path adopted by Sant Ajit Singh, SAD MLA from Anandpur Sahib, who has declared his intention of contesting the next election as an Independent candidate. Both SAD patron Parkash Singh Badal and SAD president Sukhbir Badal have been going to the homes of prominent dissidents to win them over. Besides Ajit Singh, MLAs Jasjit Bunny, Malkiat Singh and Harmeet Singh are stated to be keeping themselves away from the poll. There is little participation in the poll campaign by the BJP, the SAD’s alliance partner. The SGPC poll has sent out two signals to the ruling alliance. First, that the dissidents are a bigger challenge to the party than outsiders and second, the party will face a daunting task if it decides to change its candidates for the Vidhan Sabha poll. The SGPC, considered a mini Parliament of Sikhs, is mainly concerned with maintenance of gurdwaras, ensuring “rehat maryada” (religious code of conduct), “dharma parchar” (religious preaching) and running of various educational institutions. These elections have, however, seen the SAD leadership highlight its "achievements" like the Right to Service Act, the Shagun Scheme, cycles scheme for schoolgirls and setting up of sports infrastructure in rural areas. He was accompanied by a delegation of senior party leaders, including Lal Singh, Sukhdev Singh Libra, Rana Sodhi, Rana Gurjit Singh, Harminder Jassi and Tript Rajinder Singh Bajwa, from Punjab. Capt disclosed that Khursheed had also met the Prime Minister on the issue. He said the minister told him that the Congress-led UPA Government was taking necessary measures for the introduction of the Act. “We are expecting the things to move faster on the issue,” he disclosed, while adding that the process had already been set into motion on the matter. The PCC President said it was quite a fruitful meeting and the minister was quite in agreement with their viewpoint. “All the necessary measures had been initiated and the process will be completed very soon. Khursheed appreciated and understood the concern of the party leadership from Punjab and said that the Government of India was already seized of the matter,” added Capt. This was the second meeting of the PCC President in pursuit of getting the Anand Karaj (Marriage) Act passed and implemented. Earlier, Amarinder Singh led a delegation to meet the Prime Minister, who had also spoken to the Union Home Minister, P Chidambaram, and Union Law Minister Salman Khursheed on the matter. SAD spokesman Dr Daljit Singh Cheema, in a statement, said that fearing a crushing defeat in the coming assembly poll, the Congress had gone berserk. "Earlier, it wrote letters to the Prime Minister urging him not to release funds for the state. Now, they are writing to the EC." This, he said, showed that there was panic in the Congress and reflected the party's "anti-Punjab" and "anti-development" attitude. He said it was first time in the history that an Opposition party was using such dirty tactics to derail development and to harm the interests of the state. Dr Cheema said apart from allegedly hatching conspiracies for stalling development, the Congress had gone to the extent of misleading courts to stall SGPC elections. He said the debt amounted to Rs 70,000 crore and not Rs 1.5 lakh crore. “The BJP is likely to spring a surprise. There is no anti-incumbancy wave. The SAD and the younger generation make a lethal combination,” claimed Sukhbir while talking to mediapersons here today. Sukhbir said the Congresss during its five-year rule had grossed a revenue of Rs 36,806 crore whereas the SAD-BJP government had been able to generate a revenue of Rs 70,890 crore. “Amarinder has become so desperate that he is stopping funds to the state in the shape of bank loans. “He has stalled a loan of Rs 1,100 crore to the state,” the Deputy CM alleged. Belying Amarinder Singh’s claims, he said Punjab stood second from the revenue growth point of view. “The Planning Commission had fixed a target of 6.4 per cent growth for 2002-2007and the then Congress Government achieved a 4.7 per cent growth. On the other hand, the commission had fixed a target of 5.94 per cent growth for 2007-2012, and we have already touched the 6.7 per cent figure. Moreover, we are not selling any government properties as is being alleged,” he said. Over the alleged misuse of gurdwara funds, Sukhbir said all accounts of the SGPC would go online in a couple of months. “SGPC chief Makkar must explain where did he spend Rs 1.62 crore he claims to have spent on transport during last year,” he asserted. Amarinder revealed that not only had the SGPC shown the Darbar Sahib at a loss of Rs 23 crore last year, for the next year, too, they have projected a deficit of about Rs 15 crore. “The SGPC’s income cannot be estimated in advance as it depends on the number of pilgrims who pay obeisance there and offer donations,” he said. As per the information gathered by the TNS team, the Municipal Corporation has miserably failed to take any preventive measures. No fogging has been done in most areas of the city. Furthermore, stagnant water with mosquitoes breeding all over is a common sight in Patiala. A light downpour spell in Patiala inundates the entire city as the drainage system in the city is extremely bad - thanks to the casual attitude of the authorities concerned. Airing their views, many city residents have alleged that municipal councillors are not paying any attention towards the problems of their respective wards as all of them are busy in the SGPC election campaign. “As all the councillors are busy with the electioneering, there is no one to even listen to our grievances,” rued Sunpreet Singh, a resident of Delight Colony. Jagmohan Singh, who is working with Harnam Singh and sons in Lakkar Mandi area, informed that its been almost one and a half month that the sewerage in their area had been leaking and despite repeated complaints, none of the Municipal Corporation authorities have bothered to resolve the problem. However, Mayor Ajitpal Singh Kohli said the civic body was indeed carrying out fogging drive since the start of the monsoon season. “We are also purchasing bicycle fogging machines to ensure that there is not a problem during monsoon season in future,” he said. Municipal Commissioner GS Sidhu denied any negligence on the part of the authorities. "The MC is taking every possible step to check that there should be no outbreak of water-borne disease or malaria/dengue cases", he claimed. On the other hand, Patiala Civil Surgeon Usha Bansal claimed that she had ensured that all doctors and paramedical staff in villages were on their toes to check any such incident. "Our ANMs are doing door to door survey and taking samples. We have got the fogging done in all sensitive areas and requested the village sarpanches to ensure that all small potholes are filled with sand. Moreover, we have sprayed medicine on all water sources in such villages,” she added. “Several studies have been held in Finland involving people who drink water from wells having uranium concentrate much higher than observed in the Malwa region. These include studies of uranium intake and risks of leukemia, stomach and urinary tract cancers etc. None of the studies on human beings reported so far have shown clear link between the uranium ingestion through drinking water and cancer risk or clinical symptoms of toxicity,” says Dr Devinder Mehta, in a report “Uranium in Groundwater in Malwa region- a scientific opinion and fact sheet”. Dr Mehta, Professor of Physics who piloted the study, discussed issues related to health problems like autism and subnormal physical growth of special children and growing incidences of cancer, which he claims are wrongly linked to uranium. For past some years, Malwa region has been attracting attention of media owing to high incidence of cancer cases there. 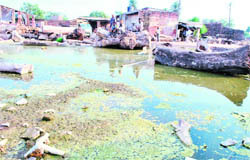 Teams of experts, including doctors from Delhi and the PGI, have visited the area to study the problem. Expressing concern over the presence of uranium in the Malwa region, the Standing Committee of Parliament on Rural Development had recently asked the government to give a clear-cut mandate to the Bhabha Atomic Research Centre to submit its report regarding uranium within the stipulated period. Dr Mehta and his associates have rejected the theory that fly ash from thermal power plants, toxic metals in Budha Nullah that flows into the Sutlej and other sources like weathering of granite rocks at Tosham hills in Haryana, pesticides and depleted uranium used in wars were reasons behind the high level of uranium in groundwater at certain places in the Malwa region. Dr Mehta asserts there are no signatures of uranium deposits as the soil has largely developed on the material laid by rivers up to depths of thousands of feet. He says agro-chemical processes are responsible for uranium contamination. The uranium content in the soil is 3 microgram per gram. Extensive irrigation and drinking water supply schemes in the region are mainly based on canals. Most of the region is water-logged and soil in the region is calcareous. Solid pieces of calcium carbonate (kankars) are common in Baluana and Karamgarh Sattran villages, where maximum uranium concentrations of a few hundred microgram per litre and total dissolved salts (TDS) of 7 gram per litre have been reported. Irrigation water percolating through soil dissolves carbondioxide produced at high pressures from the plant root respiration and the microbial oxidation of the agricultural matter. The resulting carbonic acid reacts with the insoluble calcium carbonate to produce soluble bicarbonate, which leaches uranium from soil and adds it to the groundwater. Due to the minimal use of groundwater, its TDS level is continuously increasing and contains bicarbonates, nitrates chlorides, bromine based anions; calcium, magnesium, potassium, sodium and strontium cations. The government agencies should think of uranium extraction from the groundwater as it is better than sea water, where Japan is putting efforts, adds Dr Mehta. Scaling the boundary wall of the school, the students covered about 32 km to reach the Ferozepur railway station and catch a train for Sultanpur Lodhi. The school authorities found the students missing during PT and an alert was sounded. A school bus, escorted by the police, reached the gurdwara and brought the students back this evening. The Deputy Commissioner, Faridkot, met the students on their return. Some complained of poor quality food in the school. “But this is no valid reason for the students to run away from the school,” the Deputy Commissioner added. The principal said most of the students were from poor rural areas. After joining Canadian army as a trooper in 1989, Harjit Singh Sajjan, now a Lieutenant-Colonel, has became the first Indo-Canadian to take command of a Canadian regiment. He took over as Commanding Officer of the British Columbia Regiment yesterday at a glittering ceremony held at Beatty Street Armoury in Vancouver. He took over from Lieut-Col Bruce Kadanoff, who had been the Commanding Officer for three years. The British Columbia Regiment has been the oldest Regiment of the Canadian army. Colonel Sajjan's appointment has come at a time when the Sikh community of Canada in general and British Columbia in particular is busy in the centenary celebrations of the oldest Sikh Gurdwara of North America at Abbotsford. It is symbolic and appropriate that for the first time a Canadian Sikh has been given the command of a Canadian army regiment. Two years after joining the army, Colonel Harjit Singh Sajjan was commissioned in the British Columbia Regiment in 1991. Four years later, he was promoted as Captain and later as a Major. Expressing delight over her achievement, Prof Sukhmeen Kaur said she was glad that her services had been recognised. “This is a very special moment for me because I have dedicated by entire life to teaching profession and what can be better than getting rewarded for your hard work” she added. Rashtriya Gaurav Awards are given to few of the extraordinary men and women who have specialised in various fields like science & technology, education, industry, fine arts, politics and social work, in lieu of the yeoman services rendered with excellence in their respective fields. She started her career as a college professor from Hindu Kanya Mahavidyala, Dhariwal (Gurdaspur) since 1989, she worked at DAV College, Batala and SDSPM College, Rayya (Amritsar) before her present assignment at Patiala since 2000. She is the holder of three postgraduate degrees along with three PG diplomas in addition to Master of Philosophy in Computer Science. Veteran freedom fighter and a close aide of Netaji Subhash Chander Bose, Ram Parkash Sharma died at his residence here yesterday. He was 98. Ram Parkash Sharma was cremated with full state honours today. Hundreds of people, including family members, politicians, district officials, paid tributes as the contingent drawn from the Punjab Police reversed their weapons as a mark of respect to the freedom fighter. Born in 1914 at Kahota village in Rawalpindi (Pakistan), Sharma had joined the Indian National Army under Bose while he was 16. Later, Sharma was arrested during the World War-II at Singapore where he remained imprisoned for six years. As soon as the news reached the village, people started gathering at Kulwinder's house to extend their wishes to them. The happiness of the family members of Kulwinder, who along with 16 others is expected to return to India next week, knew no bounds. “We went through inexplicable pain and spent countless sleepless nights, since our son was held by the police in Sharjah,” said Baldev Singh, father of Kulwinder with tears in his eyes. The relieved family thanked SP Singh Oberoi, a Dubai-based businessman, who was instrumental in helping the youths is escaping the gallows, who was instrumental in helping the youths is escaping the gallows. “He has emerged as a God-like figure for us. What he has done for my son and the other youths is just incredible. I have no words to express my gratitude to him. It is only due to his efforts that we are going to get back our son,” said Baldev. The crime had taken place in Mumbai’s Shere-Punjab colony, Andheri, where the convict, Ajitsingh Harnamsingh Gujral, had shifted after suffering business losses in Ludhiana. Acknowledging that the killings were followed by a quarrel with his wife at midnight, the Bench, however, noted that the fact he had brought a large quantity of petrol into his house showed that he had pre-planned the “diabolical and gruesome murder in a dastardly manner.” The murders therefore fell under the “rarest of rare” category warranting death penalty, it asserted. Gujral had committed the crime about 27 years after his marriage with Kanwaljeet Kaur. The other victims were his son, Amandeep Singh, aged 20, and the two daughters, Neeti and Taniya, aged 22 and 13. The apex court said it was legally bound to award death sentences in such cases despite the fact that the death penalty had been abolished in 96 countries and had not been used in 34 countries for a long period of time. “As long as death penalty exists in the statute book it has to be imposed in some cases, otherwise it will tantamount to repeal of the death penalty by the judiciary,” the Bench noted.